Salt…dash it or ditch it? SALT! Once a revered and ancient condiment that brings out the natural flavors of food, has become the most feared and evil condiment blamed for our countries epidemic of high blood pressure and water retention. Doctors everywhere are recommending that their patients avoid salt at all costs via strict diets and salt-free seasoning. What in the world has happened to our beloved salt? After all, our bodies are made up of 72% salt water, and we need salt to survive! In fact, one study revealed that people consuming less than 2300 mg of sodium daily (the recommended daily allowance) had a greater chance of dying than other people. What gives? Well, according to a 1991 study by CSPI “Processed and restaurant foods account for more than three-quarters of all sodium,” meaning most of the sodium we are consuming is not coming from the salt we put on our foods at home. With the rise in convenience foods and incidence of eating out has come a huge rise in salt-related health problems. So by cutting out a lot of processed, take-out, and restaurant prepared foods, we should be able to reduce these health issues, right? Well, yes and no. Preparing the majority of your foods at home will cut a large amount of sodium out of your diet, but the fact remains that not all salt is created equal. Most ‘table salt’, used in food prepared both in and out of the home, is highly refined and processed, which removes the trace minerals that are healthy and essential for our bodies. This type of salt also usually contains additives such as anti-caking agents and dextrose (sugar!). On the other hand, sea salt, minimally or unrefined salt, contains with it all of the natural minerals and usually contains no additives. Along with cutting down on high sodium processed foods, this is the type of salt we should be using when preparing our foods at home. In fact, some people find that using natural and unrefined sea salt does not affect their blood pressure at all. When looking for a sea salt to buy, there are so many choices. The first step is to look at the ingredient label and make sure there are no other ingredients in it besides salt! Real sea salt also usually has some color to it and is not bright white like the salt we are used to. This color is the naturally occurring minerals in the salt. Another important thing to consider is where your salt comes from. All salt comes from the ocean, but many salts are evaporated from current ocean water, thus are exposed to environmental pollutants in the water. Look for salt that is mined from underneath the ocean, which keeps it from being exposed to pollutants. Lastly, many people feel they need to eat iodized salt, which is salt that has iodine added to it. Iodine is an important mineral that is necessary in our diets for healthy thyroid function. However, it should be noted that sea salt does contain some naturally occurring iodine, while iodine can also easily be found in our food supply. Some foods highest in iodine include milk, dried seaweed, eggs, fish and shellfish, navy beans, and plain yogurt, just to name a few. My favorite salt is “Real Salt”, a specific brand of sea salt, and I use it in all my cooking. For more information on salt check out Real Salt’s “Guide to Understanding Salt”. Whisk together oil, vinegar, honey, and salt in a small bowl until well combined. Set aside. 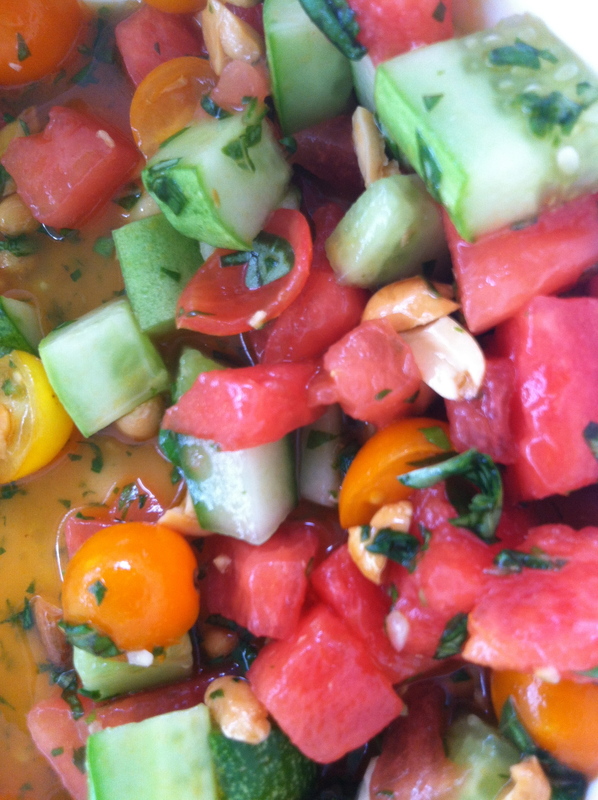 In a medium bowl, combine watermelon, cucumber, tomatoes, scallions and basil; add dressing and toss gently to combine. Just before serving, sprinkle with peanuts. Tip: To toast nuts: Heat a small dry skillet over medium-low heat. Add nuts and cook, stirring, until lightly browned and fragrant, 2 to 3 minutes. Transfer to a bowl to cool. ← Yay for Yogurt…and a recipe!